Price Reduced!! Seller's are motivated! Build your dream home or move right in!! LOCATION! LOCATION! LOCATION! Gorgeous view! BOATER'S Direct access, no bridges to the Caloosahatchee river, which is 2 minute boat ride from your new home. 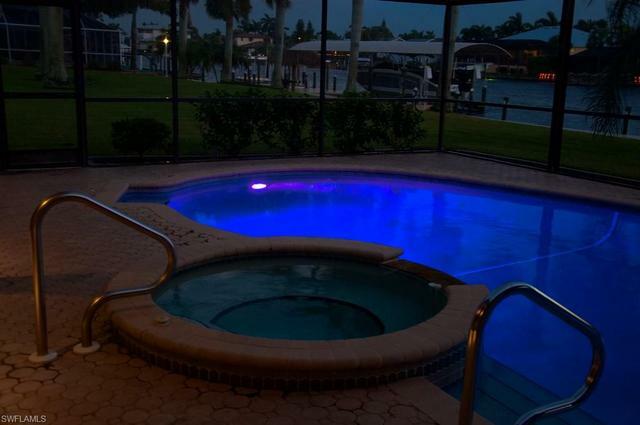 This OVER-SIZED 3 lot southern exposure salt water pool/spa home features 3 bedrooms,2 baths and is located in the desirable Palaco Grande neighborhood on one of the widest canals in Cape Coral measuring in excess of 200'. The composite dock runs almost the entire length of the property and has a 16,000 lb. boat lift and reinforced seawall. Some of the home features include a remodeled kitchen with new granite counters and stainless steel appliances. Bathrooms have also been remodeled. There are 3 sets of pockets sliders leading to the screened lanai with heated salt water pool/spa. This is a must see!! BOATER'S, SNOWBIRDS, INVESTOR'S and year round RESIDENTS. You don't want to miss this gem!! Call today to schedule you private showing! Sellers are reviewing all offers! I was searching for a Property and found this listing (MLS® #218082708). Please send me more information regarding 1910 Se 36th St, CAPE CORAL, FL, 33904. Thank you! I'd like to request a showing of 1910 Se 36th St, CAPE CORAL, FL, 33904 (MLS® #218082708). Thank you!